4 Great Tips For Sensitivity After Teeth Whitening in Wetherfield! Everyone can agree that a beautiful, white smile is a great asset. Studies have shown time and time again that people who smile are perceived as more attractive, likable and intelligent – and who doesn’t want that?! The only catch is that teeth whitening in Wetherfield can lead to (temporarily) sensitive teeth. While it’s completely normal, some people get it and some lucky people don’t. In this blog, you’ll find out why certain people can’t whiten without getting sensitivity and learn about four of the best tips to reduce it! Why Do Some People Get Sensitivity and Other Don’t? Teeth are actually covered in countless tiny “pores” that allow cold, heat and pressure to reach the nerve. While this gives you valuable information about the food you’re eating, it isn’t always comfortable. Just like genetics are behind why some people spend a day in the sun and get a tan, while others get a terrible sunburn, there are genetic reasons behind sensitive teeth as well – which is obviously beyond your control! But, there are several things that are in your control that make a big difference and allow you to get the white smile you’ve always wanted. Sensitivity toothpastes have active ingredients that “plug” the pores in your teeth, blocking cold, heat or pressure from ever reaching the nerve. Similarly, a dentist can give you a high-fluoride toothpaste specially designed for sensitivity that works in much the same way. Remember that the effects are cumulative, so these products can take 1-3 weeks to work. That means it’s a good idea to start using them a few weeks before you start whitening! One of the advantages of doing a professional whitening treatment at home is that you can customize it to your needs. The usual instructions say to put your trays in every day for 1-2 weeks, but if you experience sensitivity, you can simply use them every second or third day. That way, you get your desired result – without the sensitivity! Brush your teeth with lukewarm water. Pass on cold foods such as ice cream. Professional whitening has many advantages, especially the in-office option. Not only is it stronger and more effective than store-bought options, you also have a professional who is monitoring your result and can offer immediate help if you experience any sensitivity. Dr. Thomas Dolan is a cosmetic dentist in Wetherfield who knows how a beautiful smile can change someone’s life. 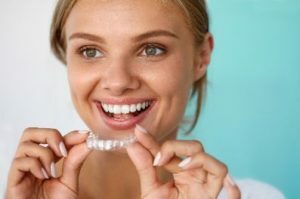 He wants every patient to get great results from their whitening treatment, so he always makes sure they know how to minimize any sensitivity they may have. If you have any questions, he can be reached via his website or at (860) 529-2000. Comments Off on 4 Great Tips For Sensitivity After Teeth Whitening in Wetherfield!